Costa Cruises celebrated its 70th anniversary on 28 May, marking the occasion during an exclusive 12-day cruise for CostaClub members onboard Costa Pacifica. 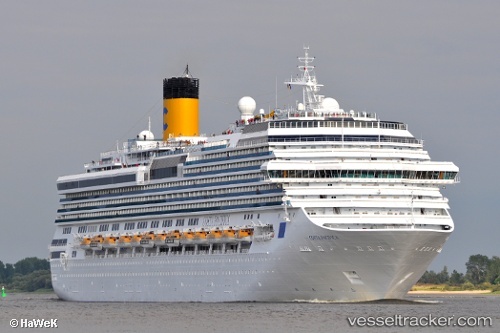 Around 3,000 CostaClub members from 18 different countries joined the voyage, which visited destinations in the Mediterranean and included a programme of events. To commemorate the anniversary, French pastry chef Christophe Adam created a three-metre-high pyramid of his famous Éclair de Génie (pastry cakes) and long-term Costa partner and chef Bruno Barbieri directed a cooking event that involved a number of CostaClub members preparing dishes. Barbieri also presented his new menu created exclusively for Costa ships. American singer Gloria Gaynor gave a concert in the ship’s theatre and Neil Palomba, president of Costa Cruises, cut a large celebratory cake. On 28 May, 2017 at 9:12 p.m. the CROSS Corsen was informed by the CROSS Gris-Nez that a passenger on the "Costa Pacifica" had fallen ill. The ship was located 25 miles off the island of Batz. Following a telephone conference with the Maritime Medical Consultation Center (MCCC) in Toulouse, the SAMU Maritime Medical Coordination and the ship, the decision was made to evacuate the patient by helicopter. The CROSS deployed a Cayman helicopter of the Lanvéoc-Poulmic naval base which took off at 10:15 p.m., arriving at the ship at 11.47 p.m. After the patient was hoisted, the helicopter headed for the Brest-Guipavas airport where he was taken in charge by a SAMU mobile hospital unit for transfer to the hospital Cavale Blanche in Brest, where he arrived on May 29 at 1 a.m.